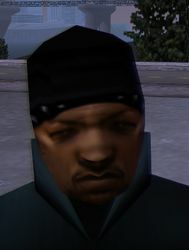 D-Ice's Brother is a character in the 3D Universe who appears as a minor character in Grand Theft Auto III. He is the brother of Red Jacks leader D-Ice. His voice actor is not credited in the games manual. D-Ice's Brother was presumably born in Wichita Gardens, the poorest neighbourhood in Shoreside Vale, Liberty City, after his brother D-Ice. He joined the Southside Hoods at an unknown time, presumably following in his brothers footsteps, affiliating himself with the Red Jacks sub-group alongside his brother. In October 2001 D-Ice employed Claude to wipe out the Purple Nines, which was finally achieved when Claude and D-Ice's Brother killed the last remaining Purple Nines gangsters. D-Ice's Brother can be killed by either Claude or the Purple Nines gangsters in the mission Rumble. This page was last modified on 9 December 2014, at 00:16.